[Satnews] Sierra Nevada Corporation’s (SNC) Space Systems was recently awarded a contract to provide multiple Passive Common Berthing Mechanisms (PCBM) by Special Aerospace Services (SAS) of Boulder, Colorado, for Orbital ATK’s Cygnus advanced maneuvering spacecraft in support of NASA’s Commercial Resupply Services 1 and 2 (CRS1, CRS2) programs. 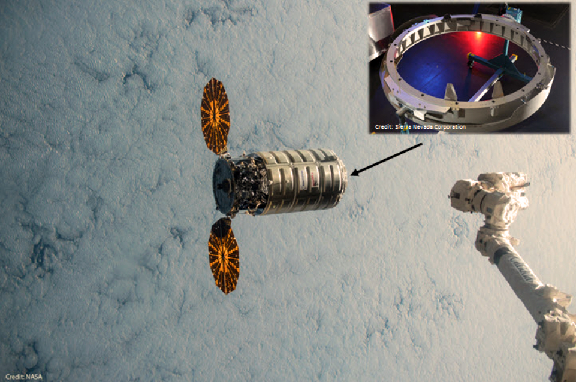 Orbital ATK's Cygnus Cargo Vehicle and SNC's PCBM Ring. This contract follows a previous order with SNC resulting in the complete delivery of eight PCBM units in support of Orbital ATK’s CRS1 missions. With the berthing of the OA-4 Cygnus spacecraft to the ISS on December 9, 2015, three SNC PCBM units have now flown and successfully berthed with the ISS. The PCBMs provide a sealed connection between Cygnus and the International Space Station (ISS), enabling delivery and removal of critical supplies. In addition to supporting Cygnus flights, SNC has also delivered a PCBM to NASA for the Bigelow Expandable Activity Module (BEAM), a two-year technology demonstration on expandable space habitats. BEAM is scheduled to launch in 2016. SNC’s Space Technologies product line offers a wide range of subsystems and components including launch adapters and separation systems, pointing systems and motion control, and electrical power systems that have flown on more than 400 missions. In addition to providing PCBMs for the Cygnus spacecraft, SNC’s wholly-owned subsidiary Orbital Technologies Corporation (ORBITEC) also developed and supplies Cygnus with the first-ever LED navigation lighting system.